Self-driving vehicles have become a symbol of Silicon Valley and Detroit, with companies such as Uber, Waymo, Ford, and General Motors zooming towards the commercialization of driverless transportation. However, few are likely aware that the United States Department of Defense (DoD) through its Defense Advanced Research Projects Agency (DARPA) could, in fact, have driverless war robots roaming the Pentagon’s battlefields much faster than Silicon Valley and Detroit can get an entirely legal self-driving vehicle onto the streets of America. “Finding new ways to lower the risk soldiers face from hostile actors – an effort known as force protection – has become a top priority for various branches of the military after sustained conflicts in Iraq and Afghanistan,” according to Karlyn Stanley, a senior researcher at the Rand Corporation who studies autonomous vehicles. “Unlike the commercial sector, the military is primarily interested in using autonomous technology to save lives,” she added. During the recent US-led military conflicts in the Middle East, coalition troops discovered that terrorist organizations were using improvised explosive devices (IED) that targeted their transportation, supply, and logistics units. The rise of the IED killed or wounded thousands of allied troops, but gave way to a “multibillion-dollar industry in vehicle and body armor, autonomous vehicles, ground-penetrating radar, surveillance, electrical jamming, counterintelligence, computer analysis and computerized prostheses,” said USA Today. With more than half of all the combat casualties from the transportation, supply, and logistics personnel. Griffin believes automated unmanned war robots could replace humans in completing these dangerous tasks during wartime. 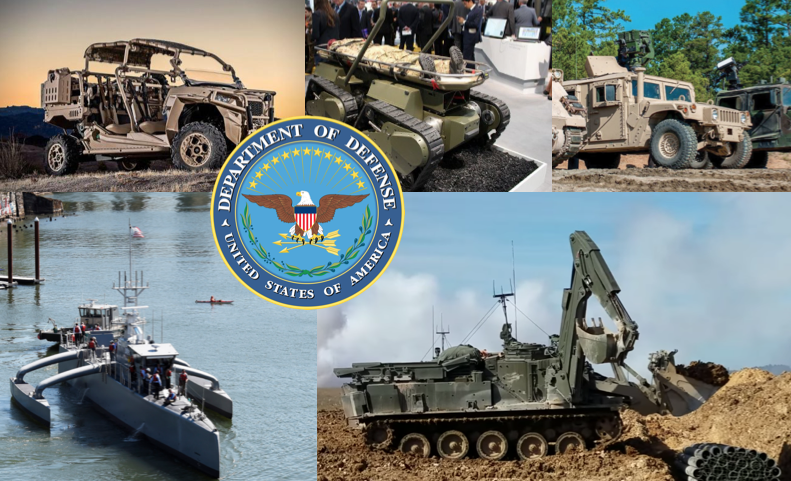 At the moment, the DoD has several autonomous military vehicles in development or are already in use on the battlefield. This month, the United States Army is sending its first robotic Humvee to a field training exercise to see if the autonomous combat vehicle can accurately destroy targets, as part of a new experimental program to weaponize robots. 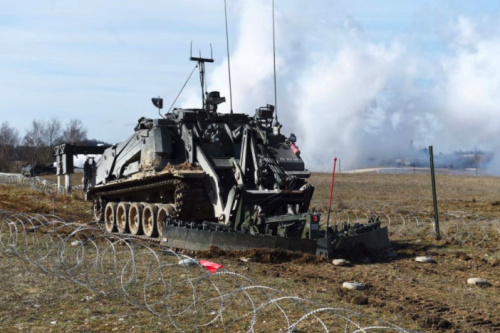 In a stunning show of robotic force, humans were absent last month during a field training exercise at USAG Grafenwoehr Army Base in Grafenwoehr, Germany. 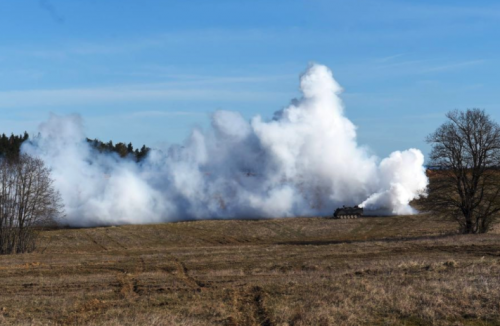 U.S./British Armed Forces and Department of Defense (DoD) contractors observed from the sidelines, as robots cleared simulated battlefield obstacles for manned tanks and fighting vehicles. For over 5-years, the United States special operations forces (SOF) have been deploying to overseas operations with a revolutionary, ultra-light all-terrain vehicle called the Polaris MRZR. The MRZR is gas powered, seats up to six, and can haul up to 1,500 lbs of payload, but light enough to fit inside an MV-22 Osprey and zip troops around the battlefield. In February, Polaris Industries, an American manufacturer of snowmobiles, ATVs, and neighborhood electric vehicles, based in Roseau, Minnesota, revealed its MRZR X, a fully autonomous upgraded version of the MRZR at the AUVSI unmanned systems show near Washington, D.C. 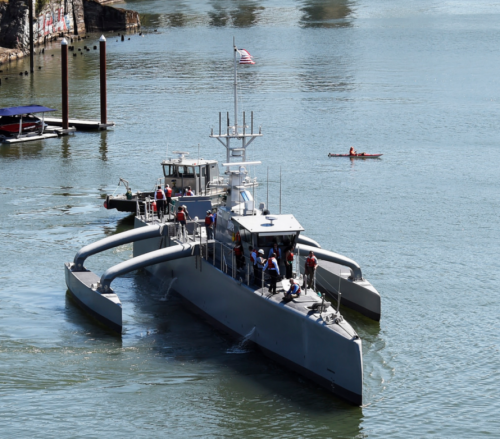 In the latest installment of the Pentagon’s preparation for the fast-approaching drone wars, a prototype autonomous ship known as the Medium Displacement Unmanned Surface Vehicle (MDUSV) has successfully been transferred to the United States Navy from the Defense Advanced Research Projects Agency (DARPA), after it completed its multi-year Anti-Submarine Warfare (ASW) Continuous Trail Unmanned Vessel (ACTUV) program. 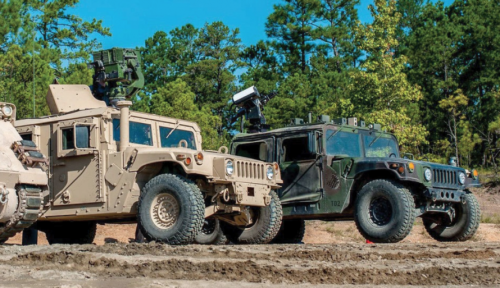 Lockheed Martin’s Convoy Active Safety Technology (CAST) autonomously manages military vehicles to significantly reduce crew fatigue, eliminate rear-end collisions, decrease human exposure to IEDs, enhance operator situational awareness and enable a more effective response to attack. Developed by BAE Systems, Ironclad is a new breed of an unmanned ground vehicle (UGV) designed to take on some of the most dangerous tasks on the battlefield. Armed with a defense budget of over $700 billion for the coming fiscal year — which will likely soar over the course of Trump’s Pentagon-controlled presidency — the DoD’s dystopian vision for the future of the military is becoming increasingly obvious with the introduction of war robots.